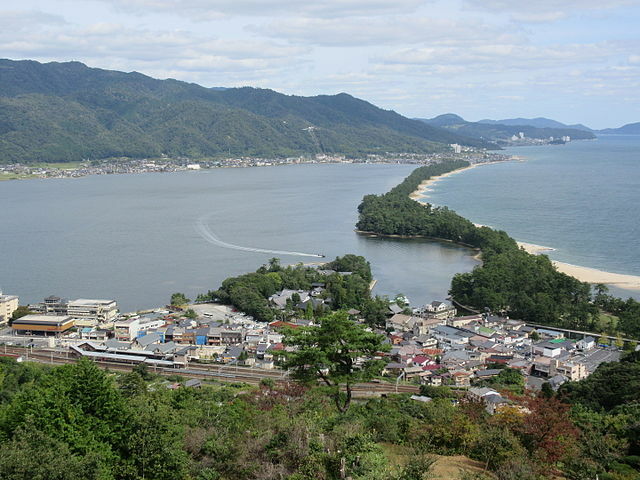 Located in Miyazu City is Amanohashidate or the "bridge in heaven", that has been admired for centuries, and is counted among Japan's three most scenic views alongside the eponymous Pine-Clad Islands of Matsushima in Miyagi Prefecture, and Itsukushima Shrine in Hiroshima Prefecture. The naturally formed land bridge is over 3 kilometers long and as little as 20 meters across at its narrowest point, is lined with nearly 8000 pine trees. Amanohashidate Sandbar is such a popular sightseeing destination for both domestic and foreign visitors, that many do not even know the name of the city that contains it. Because of this it has its very own railway station. The small villages on both the north and south sides of the Sandbar can easily be explored on foot, as distances are short. 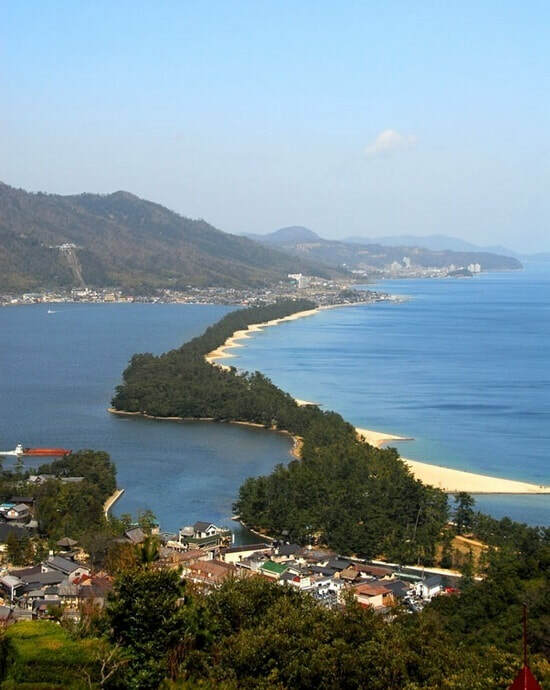 ​In the village of Monju on the south side of the Sandbar, the Amanohashidate Station is only a hundred meters from numerous ryokans, restaurants, dried fish shops and souvenir shops. 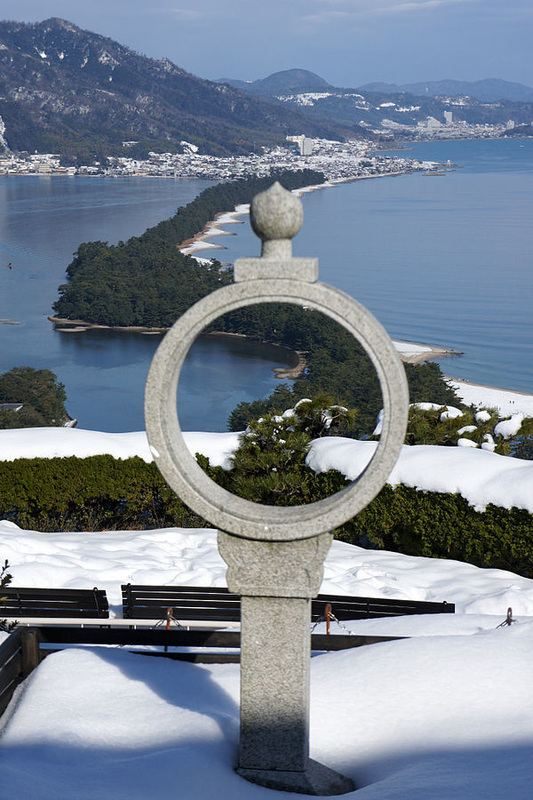 The eastern coast of the Amanohashidate is lined by white sand beaches, which are popular swimming spots in summer. Several other attractions can be explored on foot or by rental bicycle at either end of the sandbar. The sandbar is best viewed from the hillside on either the south or north side of it. 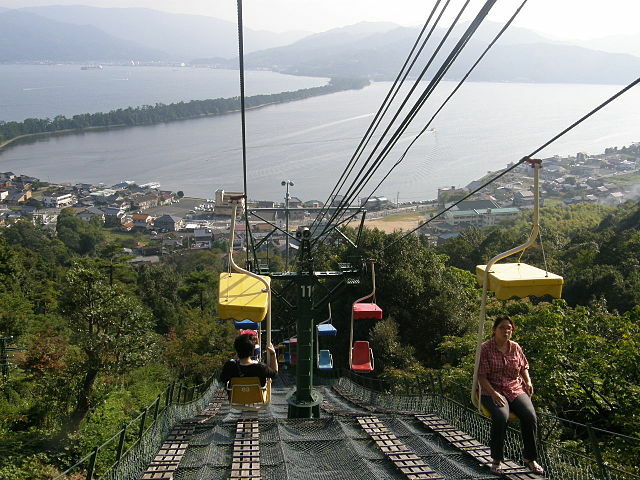 On the south side, there is a chair lift as well as monorail that you can ride up to Amanohashidate View Land which is a small theme park. ​It features a variety of amusements, such as a Ferris wheel, roller coaster, mini golf and go-karts. You can rent a bicycle at one of the many bicycle rental shops around Amanohashidate Station to ride across the Sandbar and bike to surrounding local tourist spots. If you prefer motorized transport, small motorboats transport passengers between the north and south sides of Amanohashidate. The boats are inexpensive and take about 12 minutes to travel the length of the Sandbar. The Rotating Bridge on the south side of the Sandbar is unique. Rather than raising like a traditional drawbridge, the middle section of this bridge rotates 90 degrees to allow boats to pass through. 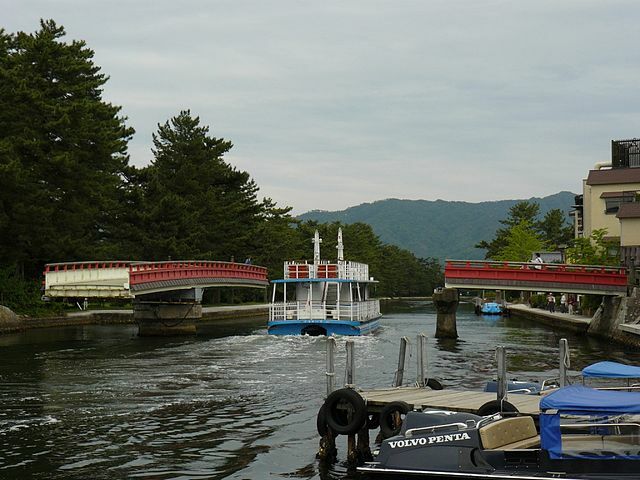 The bridge is located near the Chionji Temple and the boats that transport visitors to the north side of Amanohashidate. Chionji Temple is located at the southern entrance of the Amanohashidate Sandbar - that is about 5 minutes’ walk from Amanohashidate Station. 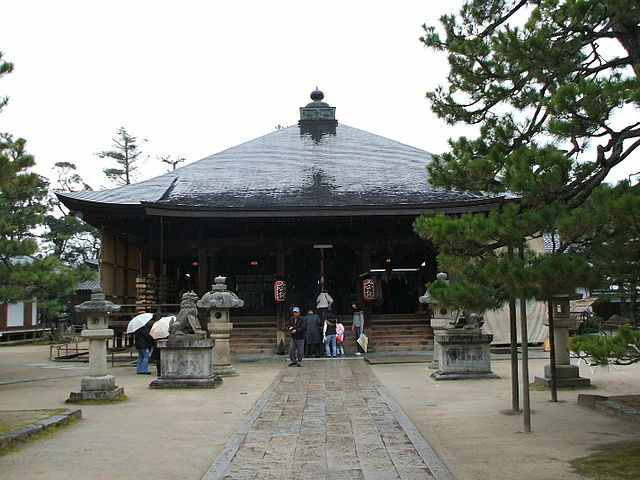 Chion-ji Temple is known as one of the three temples in Japan dedicated to the Bodhisattva Monju. People wish to gain wisdom at this temple. ​The temple houses one of Japan's "Three Important Statues of Monju Bosatsu", the Buddhist god of wisdom and intellect. 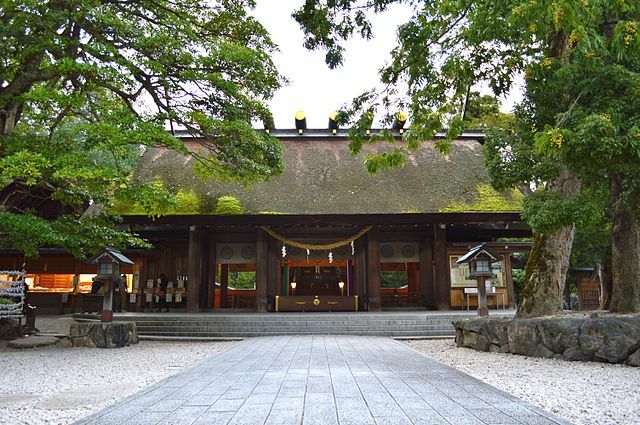 Motoise Kono Shrine is an old shrine that has a strong affinity with the famous Ise Shine in Mie Prefecture. 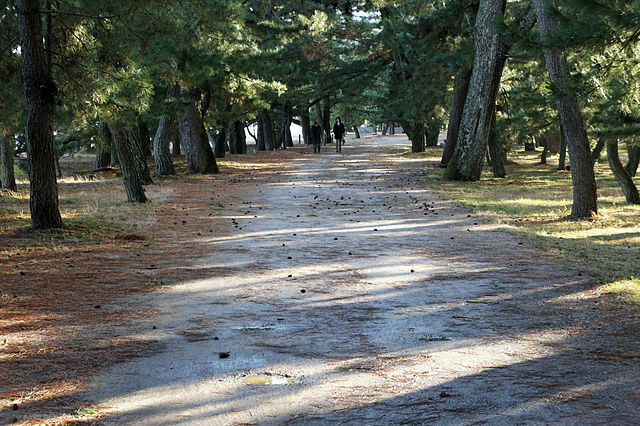 Historically it is the most important shrine of the Tango Region in northern Kyoto Prefecture. The Shrine stands near the northern end of the Sandbar - that is about 25 minutes’ by bicycle from Amanohashidate Station. On the mountain slope of the north side of the Amanohashidate lies Kasamatsu Park which is accessible by Chairlift and Cable Car. The traditional way to view the Sandbar called "Matanozoki", is to turn your back towards the bay, bend over and look at it upside down from between your legs. This is supposed to make the bridge appear as if it floats to heaven. Nariai-ji Temple grounds are high enough on the slope to offer some nice views over the bay below. But it takes a little bit of effort to access them. Nariai Temple is known as the place where wishes come true, according to Kannon’s words, the Buddhist Goddess of Mercy. 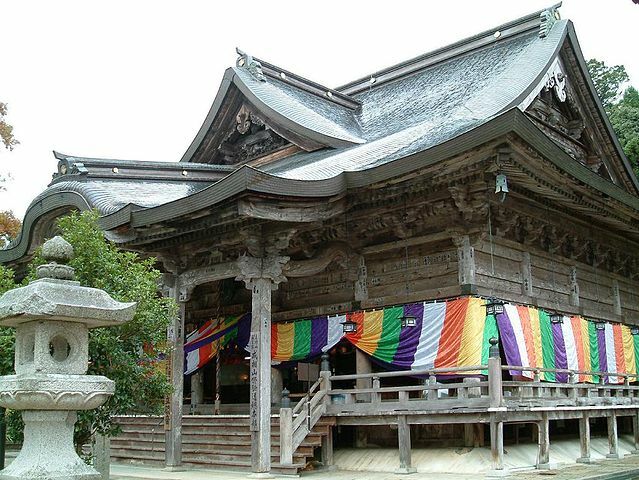 Nariaiji Temple is one of the 33 temples that are visited along the Kansai Kannon Pilgrimage in Western Japan. From Kasamatsu-park shuttle buses depart for Nariaiji Temple every 20-30 minutes "takes about 7 minutes". From Kyoto - Direct Hashidate Limited Expresses run four times a day and connect Kyoto Station to Amanohashidate "takes about 2 hours". At other times, you can take the Kinosaki Limited Express from Kyoto to Fukuchiyama and change to the Tango Relay Limited Express to Amanohashidate. From Osaka - Take the Kounotori Limited Express to Fukuchiyama, and transfer to either the Hashidate or Tango Relay "takes about 2 hours and half". 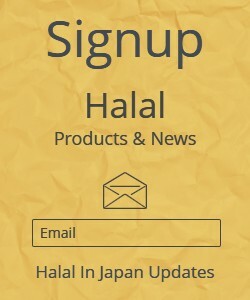 The entire journey is covered by the Kansai Wide Area Pass, Kansai Hokuriku Area Pass and Kansai Hiroshima Area Pass. However the nationwide Japan Rail Pass is not valid on the Kyoto Tango Railway between Fukuchiyama and Amanohashidate. By Bus: Tankai Bus makes two daily round-trips to Amanohashidate from JR Kyoto Station Bus Terminal "takes about 2 hours", and three daily round-trips from Hankyu Umeda and the Shin-Osaka Bullet Train Station in Osaka "takes about 3 hours".